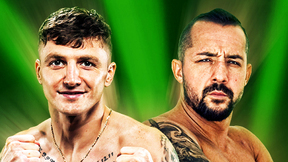 PRIDE 16: Beasts from the East saw a memorable fight night including the MMA return of 2x UFC tournament winner Don “The Predator” Frye, and featured a main event rumble between Antonio Rodrigo Nogueira vs. former UFC heavyweight champ Mark Coleman. 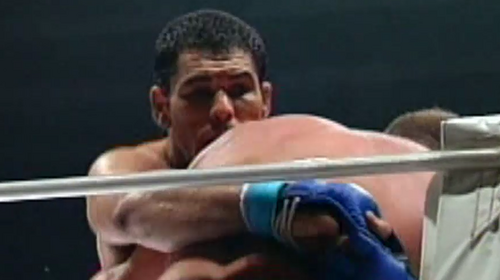 Minotauro Nogueira vs. Mark Coleman PRIDE 16: Beasts from the East Mon, Sep 24, 2001 (16:15) In an old guard vs. new guard matchup, former UFC heavyweight champ & PRIDE Open-Weight GP winner Mark “The Hammer” Coleman entered the ring to collide with a surging talent in BJJ blackbelt Minotauro Nogueira, who was on a 6 fight win streak with 5 sub stoppages. 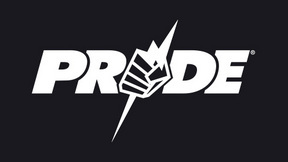 Don Frye vs. Gilbert Yvel PRIDE 16: Beasts from the East Mon, Sep 24, 2001 (21:06) Making his PRIDE debut, former 2x UFC tournament winner Don “The Predator” Frye was riding a 5 fight win streak with all wins by finish into his jump into the Japanese promotion’s ranks against Dutch Muay Thai striker Gilbert “The Hurricane” Yvel. Semmy Schilt vs. Akira Shoji PRIDE 16: Beasts from the East Mon, Sep 24, 2001 (13:57) Making his PRIDE debut after a 1-1 stint in the UFC, the 6’11” Dutch karate striker Semmy Schilt owned a 19-10-1 pro record including 10 KO/TKO wins and was set to face fan-favorite Akira Shoji with his 8-5-5 pro record and ready for his 13th PRIDE bout. Ricardo Arona vs. Guy Mezger PRIDE 16: Beasts from the East Mon, Sep 24, 2001 (33:29) Making his PRIDE debut, 3x ADCC World Submission Wrestling Championships gold medalist Ricardo “The Brazilian Tiger” Arona with his 5-1 pro record was set to face well-rounded MMA veteran Guy Mezger with his 28-12-2 pro record. Assuerio Silva vs. Yoshihisa Yamamoto PRIDE 16: Beasts from the East Mon, Sep 24, 2001 (6:51) After securing a heel hook submission win in his PRIDE debut, BJJ blackbelt Assuerio Silva was riding a six fight win streak with all victories via finish and readied for a rumble with Japanese pro wrestler & 24 fight MMA veteran Yoshihisa Yamamoto. 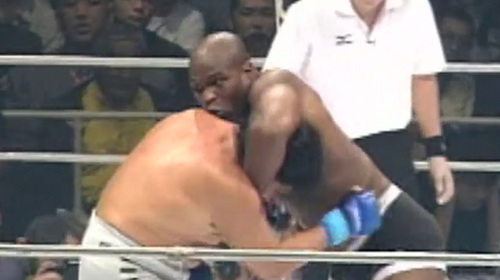 Gary Goodridge vs. Yoshiaki Yatsu PRIDE 16: Beasts from the East Mon, Sep 24, 2001 (9:18) In a rematch of their original PRIDE 11 encounter, the ever-explosive Gary “Big Daddy” Goodridge with his 14 career wins all via stoppage squared off with former 2x Japanese Olympic freestyle wrestler turned professional wrestler Yoshiaki Yatsu.